Flyphabet was a child's spelling game I developed with Philippe Piernot (at Interval Research Corporation) as an experimental prototype application for a novel tangible input device, a digitally-enhanced flyswatter. In the game, a number of flies descend on the user's collection of food, and attempt to fly away with an item. These flies are lettered, such that taken together they spell out the name of the item they are attempting to steal. The user's objective is to splat the flies in order, correctly spelling out the name of the item, before the flies carry the item away. 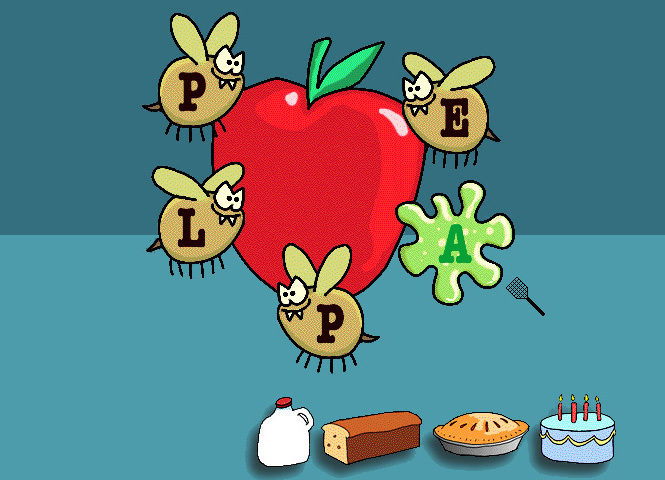 In the screenshot above, flies spelling out the word "apple" are attempting to make off with one; the user has made a good start at preventing them. Flyphabet was implemented in Macromedia Director.